2014 is a tough and rough year. However it is also a good year, as I kind of picked up reading again (thanks to the Kindle Paperwhite II, my fourth Kindle), even though I am still a slow reader. 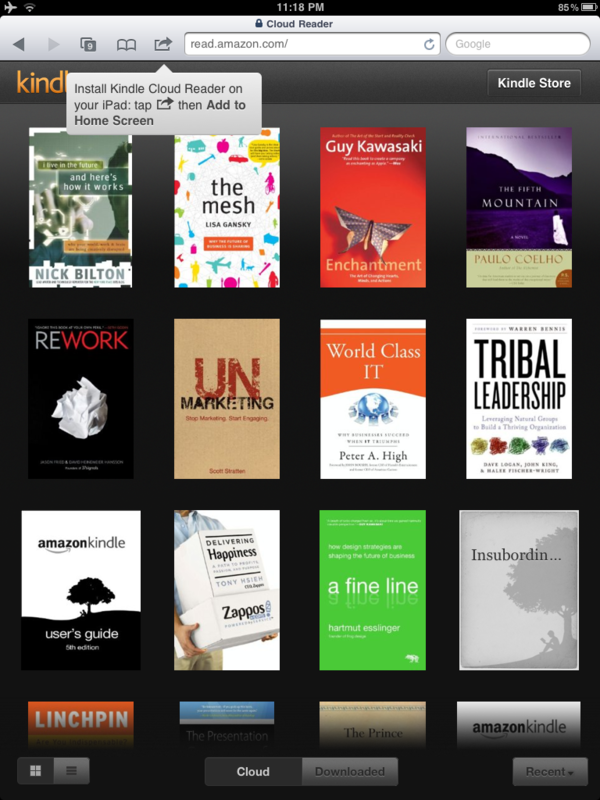 Managed to only finish 20 Kindle eBooks this year, and my favourite ones are “Stuffocation“, “Lean Startup“, “Service Design” and “Pitch Perfect“. 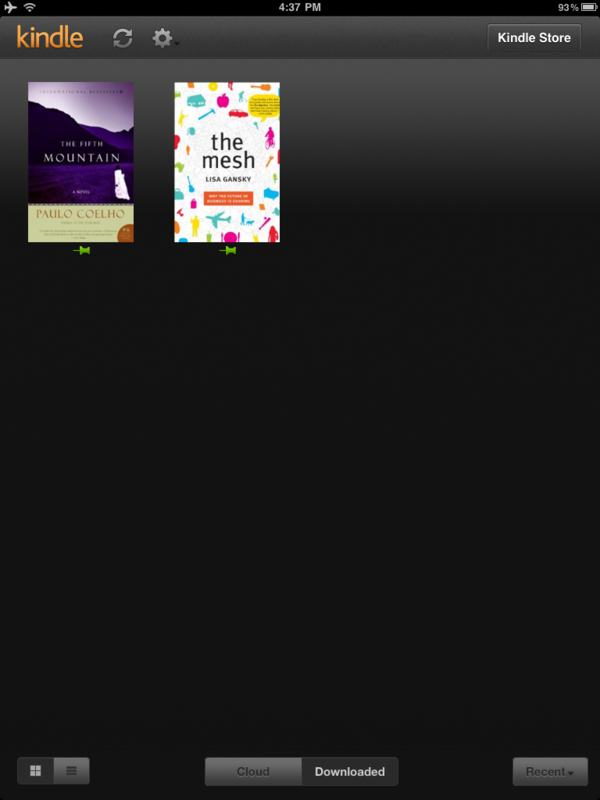 Still, there are a few books in the Kindle impatiently waiting … shall be good for the next three, four months !! Before I shamelessly promote myself as a big fan of Kindle Apps, I better tell you that I am also a big fan of Kindle eBook reader. I really love the Kindle Apps as it works very well in tablets like iPad (I think people just use the term “iPad” instead of tablet anyway). Therefore when I know Amazon released the Kindle Cloud Reader, I have to review it …I set up the Cloud Reader without any problem, but it’s not that intuitive to set up your library for offline reading … anyway, here is the full details (with photos by the end of that blog post) of that new offering from Amazon. 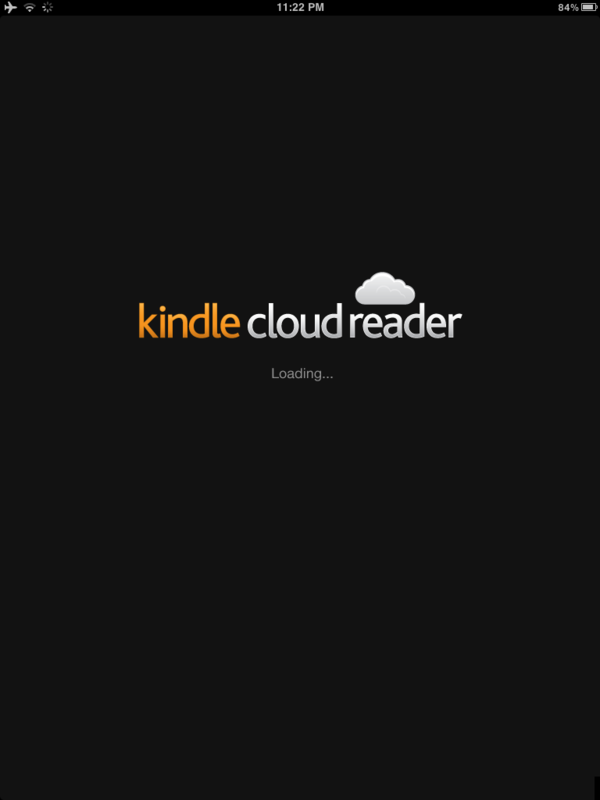 First of all, go to the homepage of Kindle Cloud Reader. Click the “Sign in to get started”, then sign in with your Amazon account credential in the next screen. That step will then kick start the Kindle Cloud Reader web application, and show you all the eBooks you have purchased for your Kindle. Next step is to increase the local database storage size (up to 50 MBytes) so that the application can save your books to your iPad (or other devices) for offline reading. And here is the tricky part, the application will also try to save the apps for offline use, and you will see that message “Saving app for offline use” in the bottom of the screen. In many cases, that step will return an error message stating “Error saving app. Tap here to try again“. If you encounter this, go to your iPad setting page and clear the cache of Safari and repeat the steps above again. The saving shall then be successful. 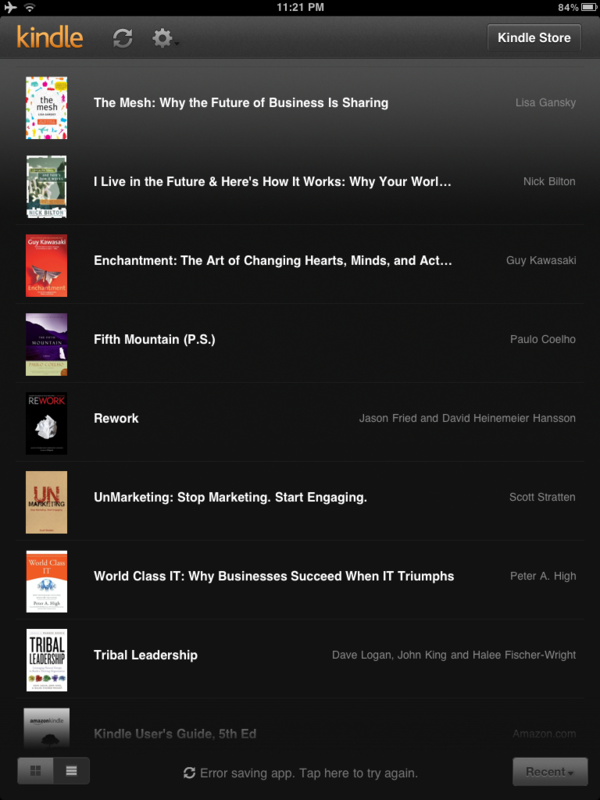 Other than the Book grid view, you can also see the Book list view. You can toggle the views from the lower right corner selection buttons. Same as the Kindle for iPad apps, you can change the settings like font size, color mode. 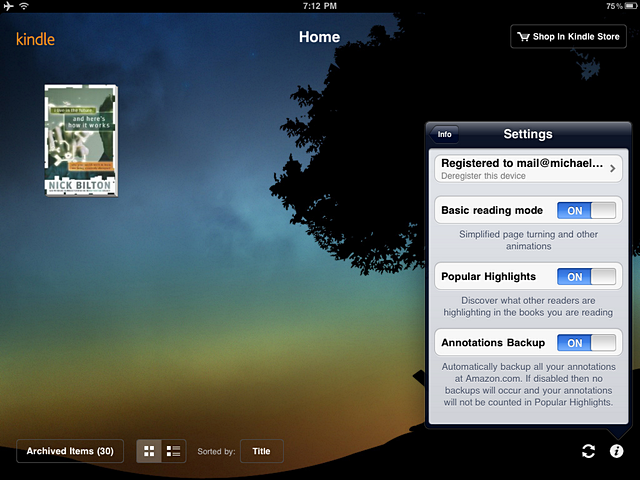 Click any book and you can start reading, and it works pretty much like Kindle for iPads. 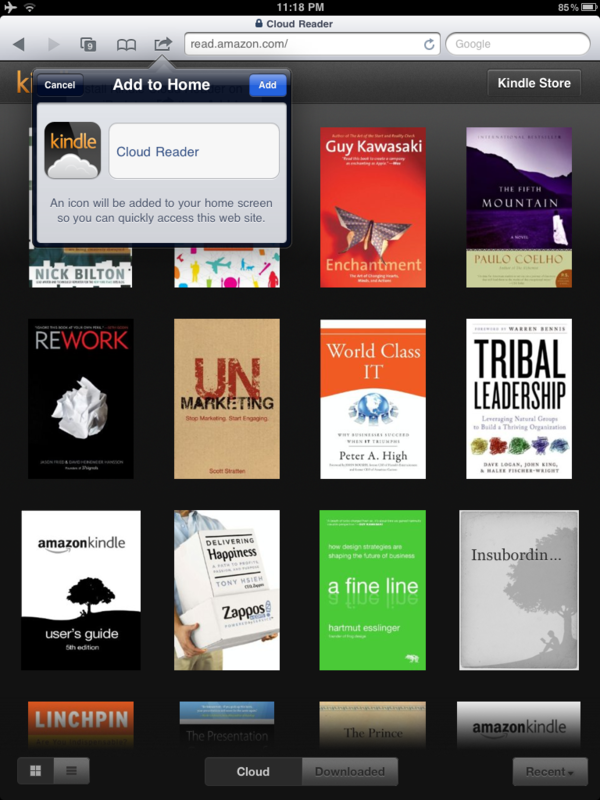 Now, try exit the apps and start the cloud reader again. 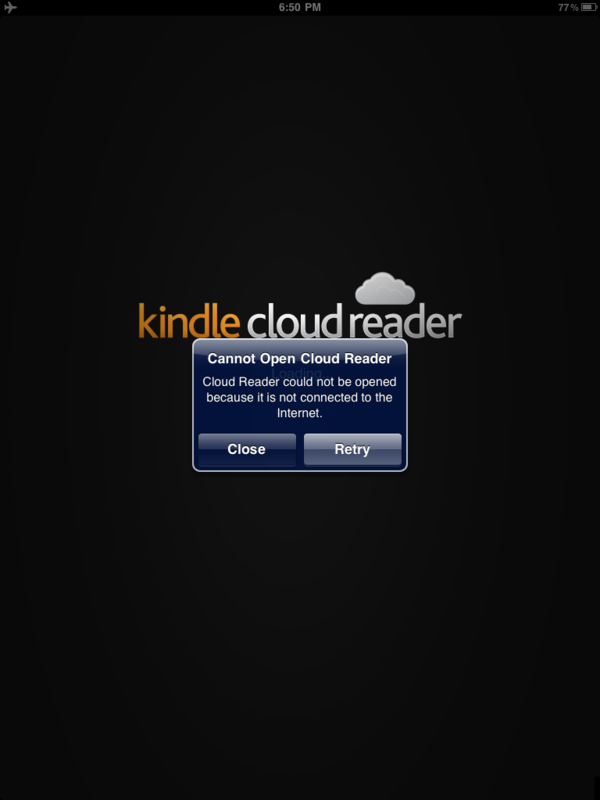 If you have not saved the app for offline use successfully (see step 2 and 3 above), you will be greeted with that error message “Cloud Reader could not be opened because it is not connected to the internet“. After the download, you will see the books are “Pinned” with a green color pin icon underneath the downloaded book and ready for offline reading !! 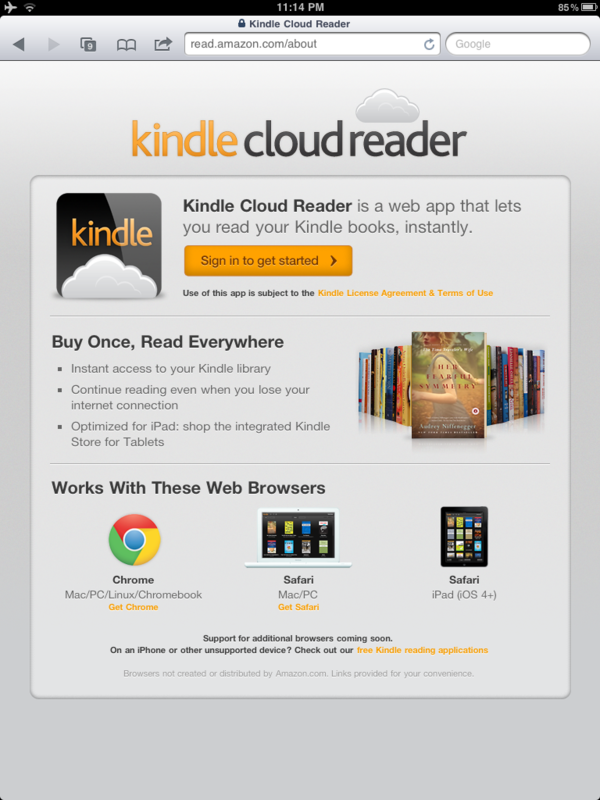 And lastly, there is the Kindle shop such that you can buy books directly within the web apps (if you’re online). 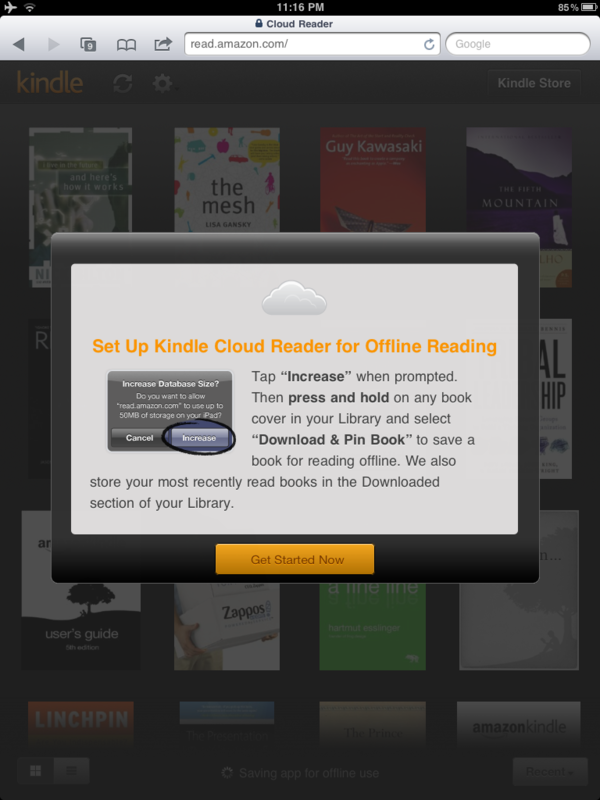 You cannot currently create new notes and highlights using Kindle Cloud Reader – but notes and highlights you create while reading the book on your Kindle or another Kindle app will be displayed. There is no built-in dictionary (I missed it a lot !!). It still feels a bit slower than Kindle reader and Kindle apps. Hope you find this review useful !! If you search “Kindle vs iPad” in Google and you will probably find over 6 millions results, in other words this topic has been discussed to death. And of course, Amazon thinks there are many good reasons why Kindle is a better ebook reader and I also blogged before that with certain settings, one can use iPad to read ebooks. I like all the colorful book covers in the home screen. It’s pretty much like the album library in iPod is great, but I still like to see all the CD covers. With the keyboard and buttons to go to next / previous page, it is a lot easier to use. You can buy ebook easily with the Kindle shop. Without a doubt, Kindle is a much better ebook reader if you like focused long form reading. However, if you can only take one device with you and reading is not your primary purpose, get an iPad. You won’t regret it. I have to admit I did not pay much attention to Kindle for iPad as the tool to read eBooks, even the application “looks” good with iPad and iPad 2. Reason is simply that I have a Kindle and it’s a much better device for reading. However, in most trips I will bring both my Kindle and iPad 2 along – the Kindle for eBooks, and the iPad 2 for emails, Facebook, RSS, and eMagazines like Bloomberg Businessweek. All your purchased ebooks are stored in the Amazon archive, you can transfer all the books from the archive to your iPad but my recommendations is to only transfer the ebook(s) you are reading to your iPad, that save space in your iPad and also the synchronization time every time you start up the application. From the lower left corner of the home page, click the “info” icon to start up the Settings menu. There are only three options but I highly recommend to turn on the “Basic reading mode”. It means it will not use the page turning effect when you touch the left / right hand side margin, but just sliding the pages. By installing the Kindle for iPad application, the dictionary is not downloaded (it is however come as a standard in Kindle). All you need to do is to “touch” any one word from any eBook, and hold it for a while, then a dialogue will be popped up and ask you to confirm to download the dictionary. It’s probably the most important part of this mini survival guide. One of the key problems to use iPad as eBook reader is the fact your eyes will get tired easily just by viewing the beautiful screen continuously, so we need to tune the screen to make it pleasant to look at. 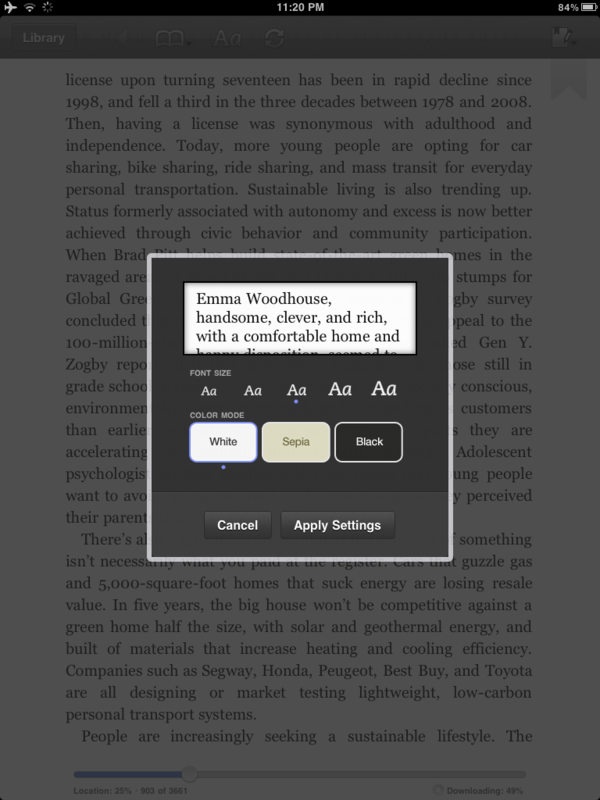 In any page of your eBook, touch screen, and select “Aa” in the bottom menu to start up the View Options menu. What I did is changed all the four options – set the right character size and brightness that fit your reading environment. Set the background to black color, and lastly set it to single column reading (it’s better than two columns when you use your iPad 2 sideways, since you’re probably using the Smart Cover). Hope the above helps a bit to your reading with Kindle for iPad. Enjoy ! Why is it not US$ 99 ? About 10 days ago, Amazon announced a new version of Kindle 3 – the same look, the same specification but US$ 25 cheaper (i.e. the new low price is US$ 114). But there is one catch – you can buy one at this low price as long as you allow Amazon to place “Special Offers” (read “Ad”) on to your Kindle. How this going to work ? If I bought this Kindle and never turn on the WiFi / 3G, how can they download the “Special offers” to my eReader ? So is it mean I can enjoy a new device with low low price without any Ads ? When will the price slashing stop ? I bought my Kindle 2 over US$ 300 two years ago and now you can get a brand new Kindle 3 for one third of the price. Why is it not US$ 99 ? I mean the psychological barrier is US$ 100, so why not another 15 dollars cut ? My view is there may be another wave of price cut in near future (say, after summer holiday). When will the next Kindle (if there is one) be announced ? The current pricing strategy makes me think that a new model will arrive very soon – may be one with color screen ? I have no good answers … but looks like at this price point, every book lover shall get one. Author Michael YungPosted on April 21, 2011 Categories Book, Services & Products, TechnologyTags amazon, kindle2 Comments on Why is it not US$ 99 ?